Chandeliers on a large billiard hall. A chandelier (/ˌʃændəˈlɪər/; also known as girandole, candelabra lamp, or least commonly suspended lights) is a branched ornamental light fixture designed to be mounted on ceilings or walls. 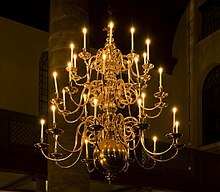 Chandeliers are often ornate, and normally use incandescent light bulbs, though some modern designs also use fluorescent lamps and recently LEDs. During the 18th century glass chandeliers were produced by Bohemians and Venetian glassmakers who were both masters in the art of making chandeliers. Bohemian style was largely successful across Europe and its biggest draw was the chance to obtain spectacular light refraction due to facets and bevels of crystal prisms. As a reaction to this new taste Italian glass factories in Murano created new kinds of artistic light sources. Since Murano glass was not suitable for faceting, typical work realized at the time in other countries where crystal was used, venetian glassmakers relied upon the unique qualities of their glass. Typical features of a Murano chandelier are the intricate arabesques of leaves, flowers and fruits that would be enriched by coloured glass, made possible by the specific type of glass used in Murano. This glass they worked with was so unique, as it was soda glass (famed for its extraordinary clarity) and was a complete contrast to all different types of glass produced in the world at that time. An incredible amount of skill and time was required to precisely twist and shape a chandelier. This new type of chandelier was called "ciocca" (literally "bouquet of flowers"), for the characteristic decorations of glazed polychrome flowers. The most sumptuous of them consisted of a metal frame covered with small elements in blown glass, transparent or colored, with decorations of flowers, fruits and leaves, while simpler models had arms made with unique pieces of glass. Their shape was inspired by an original architectural concept: the space on the inside is left almost empty since decorations are spread all around the central support, distanced from it by the length of the arms. One of the common uses of the huge Murano Chandeliers was the interior lighting of theatres and rooms in important palaces. ^ "Chandelier". Dictionary.com. Retrieved 2 May 2014. ^ "Chandelier - definition". Merriam-Webster. Retrieved 21 February 2015. ^ Ruth A Johnston (15 August 2011). All Things Medieval: An Encyclopedia of the Medieval World [2 volumes]: An Encyclopedia of the Medieval World. ABC-CLIO. p. 450. ISBN 978-0-313-36463-1. ^ "A History of the Chandelier". ^ "Chandeliers - a brief history through time | Italian-lighting-centre". www.italian-lighting-centre.co.uk. Retrieved 2017-05-20. ^ "Albrici - Antique Store in Florence". Albrici. Retrieved 2017-05-20. ^ "Lampen". www.decofeelings.nl (in Dutch). ^ Başkanlığı, Turkey Büyük Millet Meclisi Milli Saraylar Daire (2009). Shedding Light on an Era: The Collection of Lighting Appliances in 19th Century Ottoman Palaces. National Palaces Department of the Grand National Assembly of Turkey. ISBN 9789756226537.